For her generous spirit and deep commitment to her field, Malestic was named the 2016 winner of CURE magazine’s Extraordinary Healer Award for Oncology Nursing. Lots of people take their work home with them, but Lynne Malestic, RN, has given the idea new meaning. The oncology nurse, who can’t wait to go to work every day to shepherd her patients through chemotherapy infusions, didn’t hesitate to volunteer her personal time when she met a couple who barely spoke English and had little income and no resources outside the hospital. As the wife underwent treatment for lung cancer and found herself unable to climb the stairs to her apartment, Malestic took the couple in until she could find them first-floor housing. Later, when the husband, by then a widower, developed cancer, Malestic and her family took him in again and cared for him until his death 17 months later. For her generous spirit and deep commitment to her field, Malestic was named the 2016 winner of CURE magazine’s Extraordinary Healer Award for Oncology Nursing. 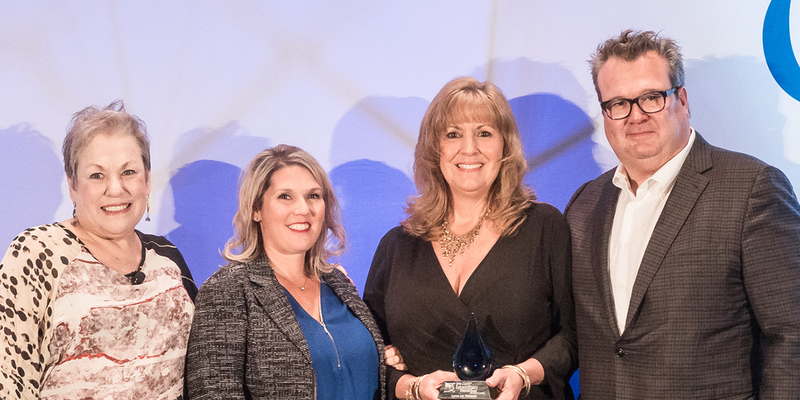 The award was given at the 10th Annual Extraordinary Healer Awards celebration on Thursday, April 28, in San Antonio, Texas; the gathering dovetailed with the 41st Annual Congress of the Oncology Nursing Society. Malestic and the winning essay will be featured in an upcoming issue of CURE magazine, and she received an all-expenses-paid spa trip for two. From left to right: Kathy LaTour, Cera Stanford, Lynne Malestic and Eric Stonestreet. Runner-up Carmi Fazio, RN, MSN, ONA, is just as willing as Malestic to work around the clock to make the lives of her patients better. Fazio, of Molina Healthcare in Illinois and a former volunteer with an American Cancer Society phone line, spends nearly all her time on her patients, is deeply connected to them and lives modestly so she can provide them with comforts such as cell phones, cable television or a new mattress, sometimes even paying for funerals. Also a finalist was Diana Gordon, a pediatric oncology nurse with the University of North Carolina Chapel Hill who was lauded not only for supporting the entire families of those she treats, but for being the quiet yet insistent conduit to making sure her gravely ill patients are accepted into clinical trials or that insurance companies pay for their medications. In a talk peppered with humor, keynote speaker Eric Stonestreet — who plays the role of “Cameron” on the ABC sitcom “Modern Family” and has seen several of his relatives and friends fight cancer — expressed respect and admiration for the three nurses, the nearly 50 others who were nominated by patients, their family members, doctors, fellow nurses or others for their uniquely meaningful contributions to their field, and the oncology nurses who composed most of the audience of more than 1,000 people. “I’m here to thank each and every one of you, the oncology nurses who are at the front line of cancer care for patients and families every single day. It’s a personal thank you that each and every one of you, as well as oncology nurses everywhere, are so deserving of,” said the two-time Emmy Award winner who has participated in many advocacy events aimed at raising awareness about the disease or money for research. Serving as mistress of ceremonies for the event was CURE’s editor-at-large Kathy LaTour, a survivor of invasive breast cancer, a public speaker in the survivor community and the author of a book, “The Breast Cancer Companion,” published in 1993. The Extraordinary Healer celebration was sponsored by pharmaceutical companies Amgen, Takeda Oncology and Bristol-Myers Squibb, whose Ready. Raise. Rise campaign to raise awareness about immuno-oncology has featured participation by Stonestreet. Since the inception of the Extraordinary Healer Award for Oncology Nursing in 2007, more than 1,000 nurses have been nominated. The winners and essayists honored over the past nine years have included men and women, adults and children, representing a variety of cancer centers and hospitals in seven different states. A fellow nurse, Cera Stanford, RN, BSN, PHN, nominated Malestic, who works at Eisenhower Lucy Curci Cancer Center Rancho Mirage, California. Cera described Malestic’s joy at going to work every day and the calm that she and her patients bring each other. Originally in obstetrics, Malestic became an oncology nurse after her best friend was diagnosed with colon cancer, and the job turned out to be a perfect fit. Her concern for the foreign couple, for instance, resulted in them having somewhere to turn in their time of need. And her caring did not stop there: After the man’s wife had passed away, Malestic and her husband and daughter kept him in their lives, not only including them in family holidays but bringing him along on vacations. The experience of caring for him in his last months was a family affair that inspired her 16-year-old daughter to decide that she wants to become an oncology nurse. Still, the experience doesn’t seem unusually generous to Malestic, who instead praised her colleagues at Eisenhower, saying they are remarkable professionals and carers who deserve recognition. Fazio was nominated by Lisa Chapman, one of the patients she met on the phone line and continues to care for long-distance. After working all day, Fazio makes herself available for many hours throughout each night to take calls from patients all over the world, answering their questions, educating them about treatment and preparing them for side effects or even for end of life. She gives all her patients her home telephone number because she wants to provide them with consistent and informed guidance throughout their cancer journeys, and offer sound advice when something goes wrong. But despite spending most of her time and money on her patients, Fazio says they have given her more than she has given them. Wearing several pieces of jewelry containing the ashes of deceased patients, Fazio said she remains in awe of their grace, courage and dignity, and that the deaths she’s witnessed were like “watching angels take flight.” Julie Blatt, an oncologist in the Division of Pediatric Hematology Oncology at the university of North Carolina-Chapel Hill, nominated Diana Gordon, RN, MSN, CPNP, CPON for being a crucial part of the team there. Gordon likes working with children who have cancer because she is able to establish a rapport that helps them and their families through therapy that sometimes spans long periods of time. Gordon credits the ability of sick youngsters to remain engaged in play and other childhood activities with helping to make these relationships possible, but her willingness to get on the floor and join in their games is definitely part of the formula. Gordon’s contributions are demonstrated not only by the security and trust she offers families, or through more administrative accomplishments such as becoming a hospital-wide expert in the EPIC computer charting system, but by her quiet insistence that her patients get what they need from clinical trial sponsors and health insurance companies. Her responsibilities include convincing insurers to reverse denials for coverage, petitioning investigators to allow specific children into trials, and, once those patients have been accepted, persuading drug developers to make experimental products available to them, even when supplies are limited. For Stonestreet, calling attention to the efforts of oncology nurses, as well as to the need for more awareness and funding around cancer research, is a personal mission. He lost both grandfathers and an uncle to cancer, his late grandmother fought the disease three times, and his mother has survived both ovarian and kidney cancers, he told the audience. In addition, one of Stonestreet’s friends has been diagnosed with stage 3 breast cancer, and another is a melanoma survivor. Fueled by his own experiences with cancer and the desire to use his celebrity to help others, Stonestreet will remain involved in Bristol-Myers Squibb’s Ready. Raise. Rise project as it enters its second year; the online effort creates awareness about immuno-oncology research and awards funding to nonprofits that support cancer patients and their caregivers. Stonestreet has also been involved with Stand Up to Cancer and an annual celebrity visit to Children’s Mercy Hospital in his hometown, Kansas City. Beyond those efforts, Stonestreet said he’s found that his often-humorous role on “Modern Family” has meant a lot to some cancer patients. He used that kind of humor in his talk, relating a story about meeting Stand Up to Cancer’s “dream team” of top melanoma physicians, casually mentioning that he had a suspicious mole on his back, and winding up in a public bathroom with “three super-nerdy guys” and his shirt removed. But the talk turned to more sobering memories when Stonestreet recalled meeting a woman who explained that he had provided her daughter with her last laughter, and the family with their last happy moments with the girl, before she died of leukemia.